Apple released Apple Pay Cash on Monday in the US. Credit Suisse says it poses no threat to PayPal’s entrenched Venmo business. Apple released Apple Pay Cash on Monday, which allows US users with an an up-to-date iPhone to send money to other iPhone users through the company’s Messages app. It’s been touted as a Venmo-killer, and wants to compete with both PayPal and SquareCash, but Credit Suisse isn’t convinced it nor Samsung’s recent patent for a similar payments product will make a dent in PayPal’s niche. The bank maintains its outperform rating for PayPal, which bought Venmo’s parent company for $US800 million in 2014, as well as its price target of $US85 for the stock – 20% above where shares were trading Tuesday morning. 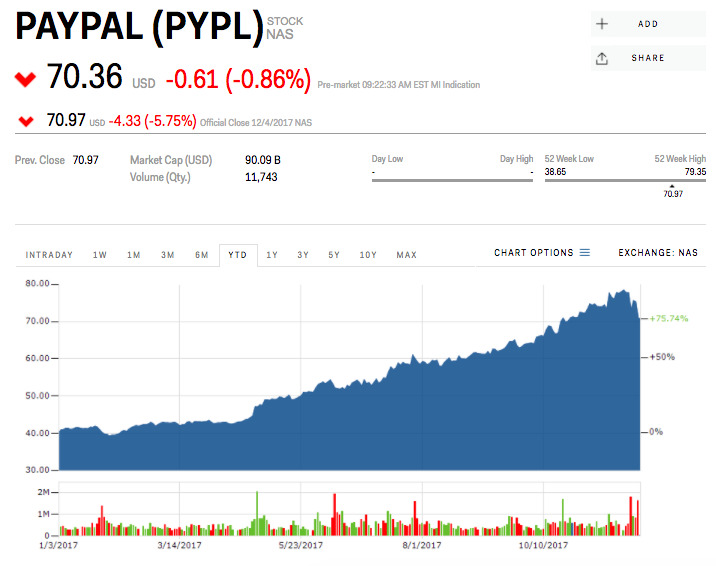 “We view Apple Cash like we view Zelle and Square Cash (SQ), all will find unique use-cases that cater to niches, but PYPL will continue to benefit from first-mover advantage,” the bank said. Shares of Paypal are up 75.74% so far this year. Wall Street analysts polled by Bloomberg believe the stock could reach $US80.55 in the next year.